Spain made their best start to a World Cup finals, demolishing 10-man Ukraine 4-0 today on an afternoon the debutants would rather forget. A first-half moment of magic by AC Milan star Kaka gave defending champions Brazil a 1-0 win over Croatia in their opening World Cup Group F match at the Olympic Stadium here yesterday. Defender Radhi Jaidi headed an injury-time equaliser today as Tunisia scrambled a 2-2 draw with Saudi Arabia which left both teams waiting for an elusive World Cup win. After a defensive mix-up, forward Zied Jaziri put a high ball into the six-yard box, which Jaidi nodded home. A lacklustre France failed to tame Switzerland in their World Cup opener yesterday, having to be content with a 0-0 draw from a tight, tactical battle at the Gottlieb Daimler Stadion. Which country have failed to score in its last 360 minutes of World Cup finals football? Minnows Togo? No, the 2000-1 debutants took only half an hour to find the back of the net against South Korea. When he took the field in the 84th minute in the France-Switzerland match yesterday, Vikash Dhorasoo (32) became the first player of Indian parentage to play in World Cup finals but the midfielder missed another history by inches when his low drive missed the target by a whisker in the dying minutes. David Beckham has pledged England will turn on the style as they attempt to secure their passage to the World Cup second round with victory over Trinidad & Tobago here tomorrow. The Real Madrid star acknowledged England were well below their best during a drab opening win over Paraguay and are determined to lay down a more convincing marker against the Caribbean minnows. "The fans are aware of how we can play and the potential we have in our team," the England captain said. After getting a dose of self-inflicted humiliation in early with a frustrating goalless draw against ultra-minnows Trinidad and Tobago it's time to deliver for Sweden as they bid for redemption against Paraguay here tomorrow. Striker Paulo Wanchope has called on Costa Rica to show the same spirit that gave mighty Germany a World Cup scare when they face Ecuador in a do-or-die Group A clash here tomorrow. The 29-year-old former Derby, West Ham and Manchester City player scored both his side's goals in their opening 4-2 defeat to the hosts and knows that only a win against Ecuador, who saw off Poland 2-0 in their opener, will suffice. The controversy over Mahendra Singh Dhoni’s disputed dismissal in the first cricket Test against West Indies in Antigua has prompted the ICC to clarify the regulations regarding boundary decisions. Needing 373 to avoid an innings defeat, West Indies were 221 for four in their second innings at tea on the fifth and final day of the second cricket Test against India here today. West Indian captain Brian Lara was leading from the front and was unbeaten on 110 and was ably supported by Bravo who was unbeaten on 14. 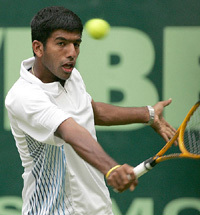 Rohan Bopanna matched Roger Federer stroke for stroke before bowing to the world number one’s might in the first round of the $ 800,000 Gerry Weber Open men’s tennis championships here today. Bopanna, ranked 267th, came up with a strong challenge before the Swiss maestro stepped on the accelerator to cruise to a 7-6, 6-2 victory in the grass court ATP Tour event. Lalchand Rajput was today named as coach of the under-19 Indian cricket team which is to tour England next month for a one-day and Test series. Former Punjab Ranji Trophy cricketer Munish Bali has been appointed as one of the coaches who have been assigned by the BCCI to train under-19 cricketers at the National Cricket Academy, Bangalore. The trials to select the Ropar district cricket team for the minor inter-district senior division cricket tournament for the Katoch shield will be held at the Government College Cricket ground here on June 17 at 9 am. Mr Arun Vij, secretary general, Fencing Federation of India (FFI), has been nominated to the Indian Olympic Association’s Press and TV Commission. Two goals from the outstanding David Villa, one a deflected free kick and the other from the first penalty awarded in the competition, a header from Xabi Alonso and a powerful volley from Fernando Torres secured Spain's emphatic Group H victory. Ukraine were reduced to 10 men after 47 minutes when Vladislav Vashchyuk was harshly sent off for tugging at Torres's shorts. "I am very pleased with the goals and in particular for the win," Villa told Spanish television. "We hope it will be the first step in a good World Cup for Spain. We gave our all today, the fans have enjoyed themselves and I hope it continues like this." Spain took their run to 23 matches without defeat since Luis Aragones became coach after Euro 2004. Although it is too early to consider them potential champions, Spain played sparkling football in defence, midfield and attack and could easily have added more goals. In contrast, Andriy Shevchenko, the 2004 Footballer of the Year who has been signed by Chelsea from AC Milan for almost £30 million, hardly had a meaningful touch. Spain went ahead after 13 minutes, Alonso bravely getting his head to the ball from Xavi's left-wing corner to notch his first international goal. Four minutes later, the lead was doubled when striker Villa's free kick took a deflection off Andriy Rusol to leave goalkeeper Oleksander Shovkovsky nowhere. Ukraine coach Oleg Blokhin attempted to pep up his side by bringing on Andriy Vorobei and Oleg Shelayev at halftime but his plans were wrecked within 90 seconds of the restart when Vashchyuk was harshly shown the red card for hauling back Torres. Villa made no mistake from the resulting penalty although Shovkovsky got a hand on the ball. Torres sealed victory with a blistering volley on the run with nine minutes to play. Kaka ended a frustrating opening period for five-times winners when he sent a curling left foot drive zipping past helpless 'keeper Stipe Pletikosa four minutes before the break for his 11th goal in the national shirt and it proved sufficient for the points with Australia and Japan to come. Mission accomplished on this evidence. In contrast to Kaka's dynamism, Ronaldo failed to shine and was hauled off midway through the second half, leaving the Real Madrid forward still looking for the goal that would see him surpass Pele as his country's all-time top scorer at the competition. Brazil began brightly, Roberto Carlos stinging Pletikosa's fingertips with a long-distance drive before Ronaldinho again forced the Croatian shot-stopper into action with a low effort which the Hajduk Split keeper turned away for a corner. But despite early trickery and industry from Ronaldinho, Croatia were not intimidated and Rangers striker Dado Prso burst down the left before cutting in to send an ambitious effort over Dida's crossbar. After 55 minutes, Ronaldo, languid in the extreme in the opening period, suddenly roused himself to shoot just over. Adriano had also been quiet and it was left to Ronaldinho to move into the centre forward position on 63 minutes, his header from a rightwing cross by veteran skipper Cafu bringing an athletic stop from Pletikosa. Robert Kovac then followed his sibling into Mexican referee Benito Archundia's book for felling Adriano. Defender Radhi Jaidi headed an injury-time equaliser today as Tunisia scrambled a 2-2 draw with Saudi Arabia which left both teams waiting for an elusive World Cup win. After a defensive mix-up, forward Zied Jaziri put a high ball into the six-yard box, which Jaidi nodded home. It was relief for Tunisia, who had led for nearly an hour before Saudi Arabia equalised and then went ahead through veteran striker Sami al-Jaber in the 84th minute. Tunisia have not won a World Cup finals match since their debut in 1978, and Saudi Arabia have not won since their debut in USA 1994. The North Africans led after a dour first half, but the game came alive on 57 minutes when Saudi Arabia equalised with the move of the match. Defender Ahmed Dokhi played a peach of a ball down the right channel for Mohammed Noor, whose early cross fell perfectly for Yasser al-Qahtani who scampered clear of two defenders and buried it first time. Saudi Arabia made changes as they pressed for a win, with midfielder Nawaf al-Temyat coming off for forward Malek al-Hawsawi, Noor making way for Mohammed Ameen and Qahtani being replaced by Jaber. And Jaber, who has now played in four World Cups, made an immediate impact as he was put clear by Hawsawi, calmly sliding a left-footed finish past Tunisia ‘keeper Ali Boumnijel — a fellow veteran and the tournament’s oldest player at 40 years and 62 days. However, the Saudis were not able to hold on to their lead and Jaidi equalised in the second minute of injury time. The North Africans had gone ahead in the 23rd minute after captain Riadh Bouazizi was fouled in front of the Saudi box. Saudi defender Redha Tukar headed on the resulting free-kick Jaziri on hand to ram the loose ball home with an acrobatic volley. Tunisia were worth their lead with clear-cut chances few and far between for the Saudis, despite winning a number of corners and free-kicks in dangerous positions. The 1998 champions, who had drawn with their neighbours twice in World Cup qualifying, could not surprise a compact and well organised Swiss side on a hot, sunny evening. They have not scored in the finals since they won the title eight years ago. France and Switzerland kept intact their chances of progressing from Group G, led by South Korea after they overcame Togo 2-1 earlier. Both sides, however, need to improve dramatically if they are to go anywhere in the tournament. Switzerland missed the best chance of the game on 65 minutes with a header from close range by substitute midfielder Daniel Gygax that France goalkeeper Fabien Barthez somehow managed to save with his foot. The match, a close affair with few thrilling moves, was played at a relatively low tempo, the players having to deal with stifling heat at first before it cooled down a bit. The first half was fairly even with arguably the best opportunity for Switzerland, when striker Alexander Frei wasted an effort from close range in the 24th minute after a distant Tranquillo Barnetta free kick bounced through untouched to hit a French post. The France fans breathed a sigh of relief and hoped for a goal seven minutes later when newcomer Franck Ribery snapped a shot narrowly over the bar from just inside the area. The French contingent then shouted for a penalty after a shot towards goal by Thierry Henry hit defender Patrick Mueller’s hand on 37 minutes. There were a couple of scares for France in the second half, notably with a powerful run into their box by Philipp Degen on 62 minutes. The good news for France was a decent performance from ageing maestro Zinedine Zidane, who will retire after the finals. Australia? No, they knocked three past Japan in their first finals in over 30 years. Try France, who yesterday extended their World Cup goal drought to four matches after their opening game against Switzerland. The 1998 champions boast some of the finest footballers around, not least Arsenal's record goal scorer Thierry Henry, but put a blue shirt on their backs and the ability to find the back of the net appears to go walkabout. If there was a GPS system available to help the ball on its way Raymond Domenech could do with one. France's journey to Germany was littered with a series of low scoring draws and judging by yesterday's result that trend shows no sign of changing. With Djibril Cisse, who was France's leading scorer in qualifying, absent with a broken leg Domenech chose to deploy Henry as a lone striker against the Swiss in Stuttgart. And while Les Bleus had goalscoring opportunities another blank sheet to add to the three they returned home with after the 2002 finals is hardly encouraging. Domenech knows he's going to have to find a key to unlock France's attack from somewhere by Sunday when they take on South Korea or they'll be in serious trouble. "The next match against the Koreans has now turned into a very important one where we have to score," he conceded. "But it's not a question of a problem in attack, what I'm concerned about more is how many points we can get in our group. "Our next game could be tight, we know the Koreans have the possibility to look for a draw and go for it in their last game. It's obvious we have to win it to be comfortable but even if we draw again it doesn't rule everything out." France and the Swiss are lying two points behind the Koreans after the Group G leaders beat Togo 2-1 earlier yesterday. Domenech said there were positives to take out of this third consecutive draw against Switzerland. "I've known much worse games between us," he said. Born in Mauritius to Indian parents, Vikash — considered coach Raymond Domenech's favourite — came as replacement for Sylvain Wiltord. David Beckham has pledged England will turn on the style as they attempt to secure their passage to the World Cup second round with victory over Trinidad & Tobago here tomorrow. The Real Madrid star acknowledged England were well below their best during a drab opening win over Paraguay and are determined to lay down a more convincing marker against the Caribbean minnows. "There's no doubt in mind that we can do it." A win over the 'Soca Warriors' would be enough to see England into the last 16 and leave them favourites to qualify as winners of Group B.
England's players are anxious to put the disappointment of the Paraguay match behind them, when they wilted in the heat and looked anything but world champions-in-waiting. Beckham and his team-mates are aware that anything other than a victory over Trinidad will be viewed as a disaster. But even though Beckham admitted it would be a "huge disappointment" if England failed to register a victory in a match they expect to win, he warned there would be no danger of complacency. "We're not underestimating them as a team but we have got a stronger team than them and we should do well and hopefully beat them. "But this is football and the World Cup and we've seen already that teams that aren't as big as other teams can still play well and do well." Trinidad and Tobago pulled off the first shock of the tournament in their opening match, holding Sweden to a 0-0 draw despite being reduced to 10 men. England coach Sven-Goran Eriksson had been reported to be considering introducing Wayne Rooney from the substitutes bench against Trinidad but it is now unlikely the Manchester United player will feature. Rooney has returned to full contact training and is shooting at full force with his right foot, which has recovered from a fractured metatarsal bone. 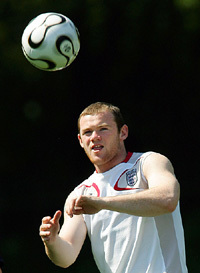 Figures in the England camp are worried however that in his determination to prove his match fitness and spearhead the World Cup challenge, Rooney could injure himself again. Either way, Eriksson is expected to continue with the 4-4-2 line-up that started against Paraguay, meaning that Michael Owen will get another chance to play himself into form alongside Peter Crouch. Owen was replaced after 55 minutes in England's opener and looked desperately short of his usual sharpness as he returns from injury. Beckham is adamant that the goals will come for the Newcastle Striker. "Michael will come good, he always does in the big competitions," Beckham said. Trinidad, meanwhile, will go into the match looking to write another chapter in what is rapidly emerging as the fairytale story of the finals. The encounter at the Olympic Stadium is make-or-break for Lars Lagerback's side with, at least on paper, their final match still to come against England. The Trinidad match has clearly taken a toll on morale amid reports that skipper Olof Mellberg and team-mate Fredrik Ljungberg had a bustup after their first game. The South American side's coach Anibal "Maqo" Ruiz insists his men can reach round two for the third successive time. "Sweden is one of the teams that we think are about our level," he opined. Striker Paulo Wanchope has called on Costa Rica to show the same spirit that gave mighty Germany a World Cup scare when they face Ecuador in a do-or-die Group A clash here tomorrow. The 29-year-old former Derby, West Ham and Manchester City player scored both his side's goals in their opening 4-2 defeat to the hosts and knows that only a win against Ecuador, who saw off Poland 2-0 in their opener, will suffice. "We left with our heads held high after the German game and we always expect to score goals," said Wanchope, who has hit 45 goals in 70 internationals. "We have a very good side and we'll stick together. "Ecuador are a really tough team and they are certainly very compact. They have very quick players such as (Ulises) De la Cruz, (Carlos) Tenorio is a threat on the right and Agustin Delgado has a good nose for goal," added the striker who is hoping that a good tournament could see him win a move to Serie A giants AS Roma. Costa Rica, playing in their third finals, reached the last 16 in 1990, but failed to get beyond the first round in 2002. Germany can secure their place in the next round if they defeat Poland today leaving both Costa Rica and Ecuador in no doubt as to what they need to do to keep their plans on track. "If Poland lose to Germany that would mean in practice that the battle for second place would be between Ecuador and ourselves," Costa Rica skipper Luis Marin told AFP. In a protocol issued to all umpires in the ICC Elite Panel, the International Cricket Council has effectively stated that the benefit of doubt should go to the fielder if there was confusion over whether the catch was taken inside the boundary. When referred to, the TV Umpire needs to just decide whether a boundary was scored or not, even if the TV replays are inconclusive, it said in a press release today. If he says the boundary was scored, the batsman is not out and if he says it was not scored, the batsman should be deemed out, it said. Explaining the protocol in detail, the ICC said, in case of uncertainty over whether a catch had been completed or a boundary scored, the on-field umpires were entitled to refer the boundary decision to the TV umpire in accordance with the playing conditions. “The TV umpire has the responsibility to make a decision solely on whether a boundary has been scored. “If the TV replay evidence is inconclusive, the TV umpire must still make a boundary decision. His decision must be made using the existing convention in cricket, which dictates that the status quo prevails, that is because no evidence exists of a boundary being scored, no boundary is awarded. ICC General Manager Cricket David Richardson said the confusion in Antigua arose over whether the third umpire was required to adjudicate on a boundary or a dismissal. Needing 373 to avoid an innings defeat, West Indies were 221 for four in their second innings at tea on the fifth and final day of the second cricket Test against India here today. West Indian captain Brian Lara was leading from the front and was unbeaten on 110 and was ably supported by Bravo who was unbeaten on 14. 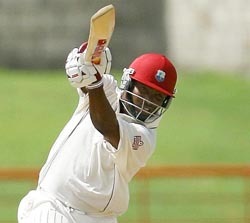 A 129 run partnership for the fourth wicket between Brian Lara and Shivnarine Chanderpaul frustrated India’s aspirations of forcing a victory over the West Indies. But just before drinks in the post-lunch session, the latter mistimed a full toss from Anil Kumble to hole out at mid on for 54, his 37th test fifty. The day dawned bright and sunny. But as the ground staff peeled off the covers, the appearance of the pitch was akin to a second day wicket, but it felt a bit moist after practically 40 hours of sweating under several layers of tarpaulin. With the surface likely to dry out, it was important for India to utilise the first hour. In the event, Kumble did strike early, delectably clipping Daren Ganga’s off bail as the batsman did not offer a stroke. At the pavilion end, Virender Sehwag gave way to Munaf Patel. And produced a gem of a ball that straightened slightly as well as bounced healthy to terminate Ramnaresh Sarwan’s stay. From 43 for one at the start, West Indies had slumped to 52 for three. This brought Chanderpaul, who has scored prodigiously against India in the past, to the crease. It was the last potentially match-saving pair for West Indies in the middle. And Lara, for a while, seemed a little under the weather, a he called for a glass of water and a pill. And the Guyanese left hander also needed attention after being hit on the elbow by Kumble delivery. Irfan Pathan replaced Patel and had two passionate appeals for lbw against Lara rejected by umpire Asad Rauf. He also had the mortification of seeing Mahendra Dhoni fail to stump, a difficult chance down the leg side, the same batsman. Meanwhile, the tall, strapping Kumble wheeled away unchanged from the media centre end. He switched to around the wicket in an effort to exploit the rough outside the two left-handers’ off stump. The odd ball bounced unexpectedly, but there wasn’t much purchase from the boot marks. He was rested as VRV Singh got his first bowl of the day. This fast-medium exponent has demonstrated greater discipline. But in so doing has sacrificed his pace. He probably has a future, but in this match he hasn’t looked like getting a wicket. Fall of wickets: 1-2, 2-51, 3-52, 4-181. Bowling: Pathan 15-2-50-1, Patel 16-6-32-1, VRV Singh 8-0-22-0, Kumble 29-4-75-2, Sehwag 19-4-33-0. Rohan Bopanna matched Roger Federer stroke for stroke before bowing to the world number one’s might in the first round of the $ 800,000 Gerry Weber Open men’s tennis championships here today. Bopanna, ranked 267th, came up with a strong challenge before the Swiss maestro stepped on the accelerator to cruise to a 7-6, 6-2 victory in the grass court ATP Tour event. The 26-year-old Indian served six aces and saved four breakpoints in the first set, pushing it into the tie-breaker. But double-faults, which has been Bopanna’s bane for long, began to catch up with him. There were as many as four of them in the second set, seven in all, by Bopanna even as Federer began to pull away. The second set also marked a drop in the Indian’s first serve percentage, from 50 in the first set to 32. Not surprisingly, Bopanna couldn’t take the two breakpoints that came his way in what turned out to be the final set. In all, Bopanna won 57 points as against Federer’s 75 in the match. New Delhi: Third seeded Indo-Czech pair of Leander Paes and Martin Damm crashed out of the doubles event losing 6-7, 6-4, 8-10 to the unheralded duo of C. Haggard and J. Novak in the first round at Halle, Germany, on Wednesday. The Indo-Czech pair was unlucky to go down in the first set in the tie-break against their South African-Czech opponents in a see-saw battle with both sides conceding one break point each, according to information received here. Birmingham: Fourteenth seed Sania Mirza fought off a sprited challenge from American Shenay Perry to storm into the third round of the $ 200,000 DFS Classic here on Wednesday. Uttar Pradesh batsman Tanmay Srivastav would lead the 15-member squad, which has eight specialist batsmen, one wicketkeeper and six bowlers, according to a press release. The Indian colts will play three one-dayers, all day-night affairs, and three Tests during the July 9 to August 10 tour. Bali, a State Bank of Patiala employee, has been selected for coaching along with former India cricketers Robin Singh and Bhasker Pillay. Munish Bali, who has played for Combined Universities against England -A, led by Mark Ramparkash, in 1995, is the only coach to have qualified from Punjab in level-3 coaching of the NCA. He has also coached the Punjab (u-15) team that won the All India Polly Umrigar cricket tournament (u-15) held at Hyderabad last year. According to Sandeep Budhiraja, secretary, Ropar District Cricket Association, the tournament conducted by the Punjab Cricket Association would be held at various venues in Punjab. A notification to this effect was received by Mr Vij yesterday from Mr Durgadas Boro, Chairman of the IOA’s Press and TV Commission.